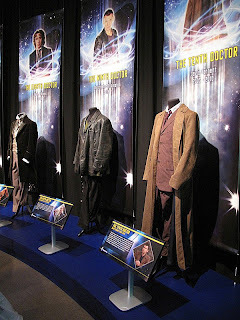 I have already written a Full Review of the exhibition itself, but here is a more targeted write-up focusing on the items of interest to a Tenth Doctor fan and giving them a more detailed look. 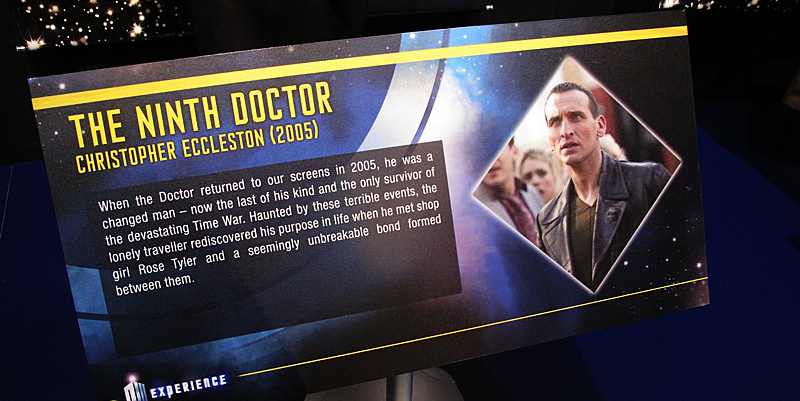 As I don’t run a blog for the Ninth Doctor, I’m including him here - after all, he pass the baton to the Tenth. 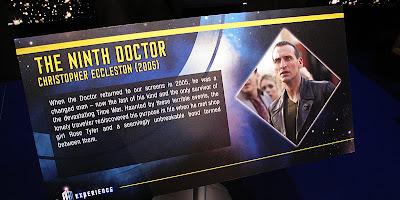 Although he never appear on the FRONT cover of the Radio Times, he did appear inside a clever barn-door cover, opening the TARDIS to reveal The Doctor and Rose beyond. 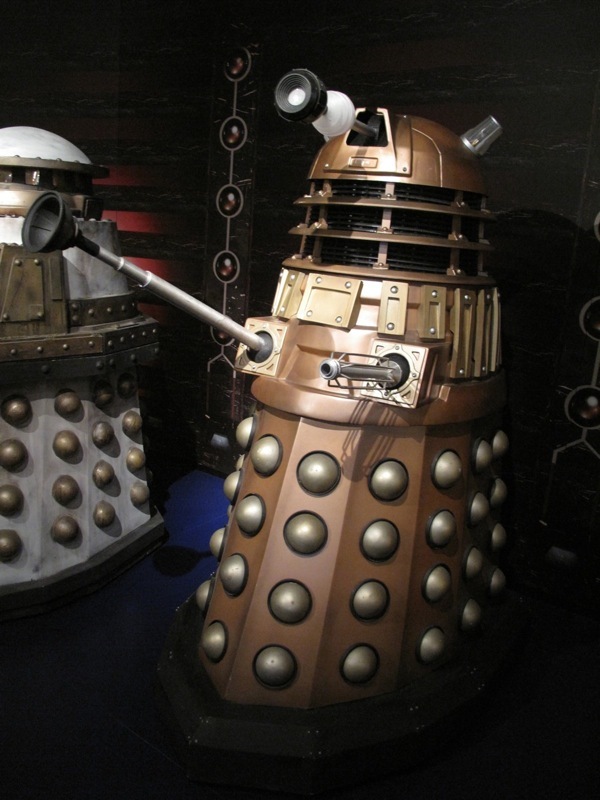 The cover display does not represent this, though the cover is there, alongside the one for Dalek, which coincided with. A UK general election. 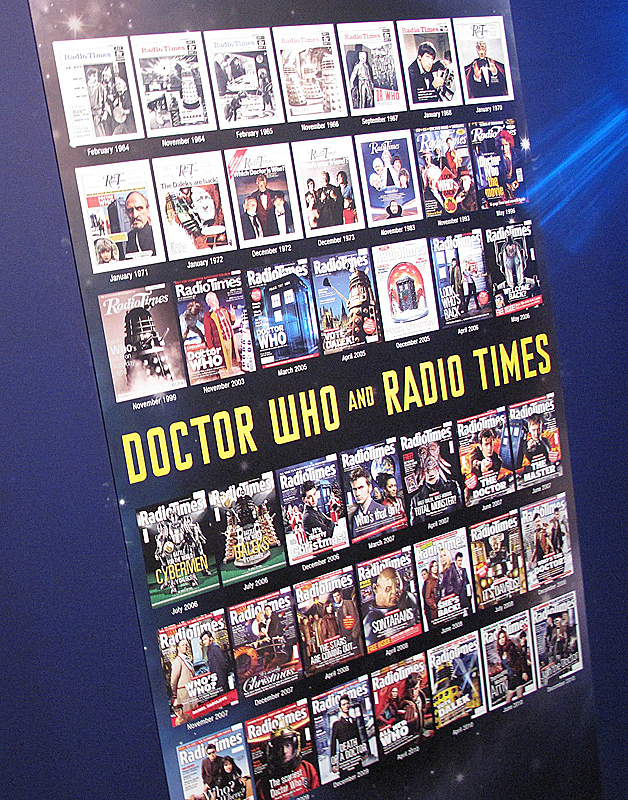 This latter cover was the most popular Radio Times cover of all time. Now there’s a claim! I am told the Ninth Doctor’s costume at Cardiff was a replica, but I’m not sure of the authenticity of the one on display here. It certainly looks very good, matching the earlier more worn jacket used in the 2005 season. 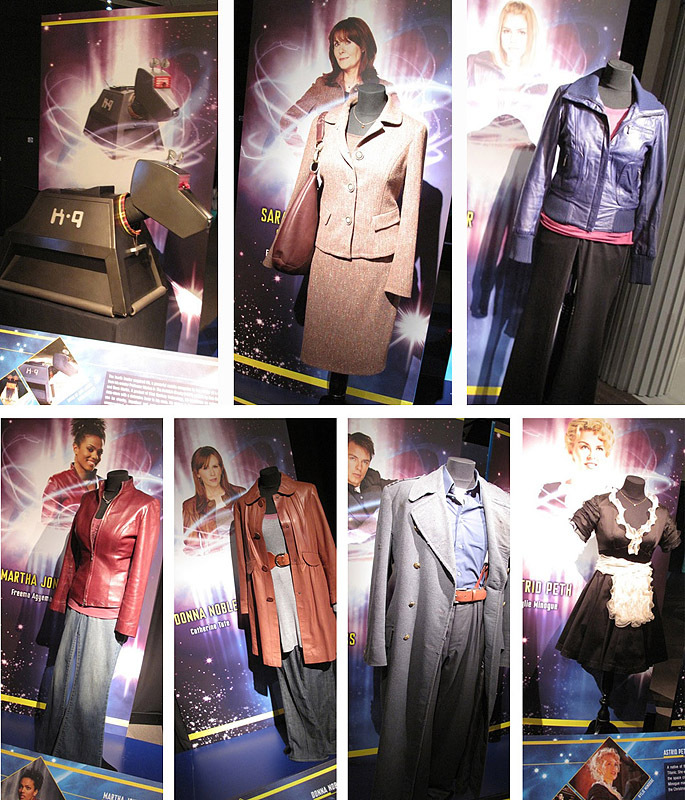 Moving past the the Doctor’s costumes, the Ninth and Tenth Doctor’s sonic (abet the melted one from Eleventh Hour) can be seen in the props display cases (see right). But then we do have the real treat of seeing the original console room introduced in the Ecceslton era (see below). Since the Ninth Doctor never encountered the Cybermen, it’s the Dalek display that provides some contact here, with a bronze version (see left). 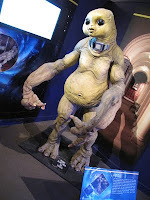 Opposite is the Emperor of the Daleks, and further in to the exhibition, a Slitheen looms over you; and from The Empty Child, the gas mask clad Doctor Constantine and Jamie (see below, left); plus a couple of Autons from Rose (see below, right). 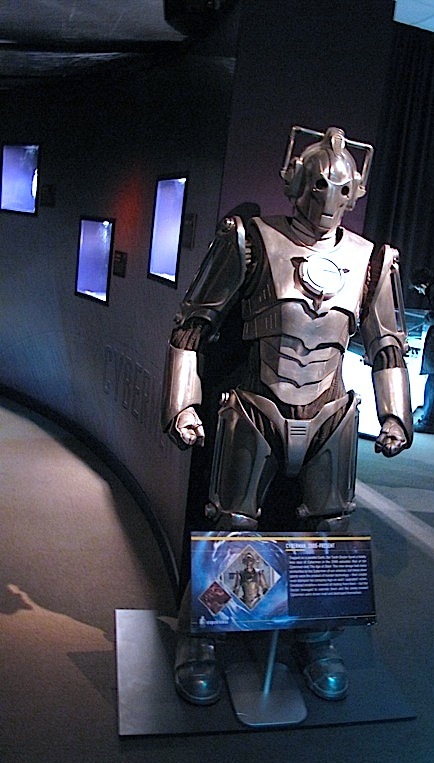 You also get to see The Face of Bo, who has been a long standing addition to the exhibitions since 2006 (see right). 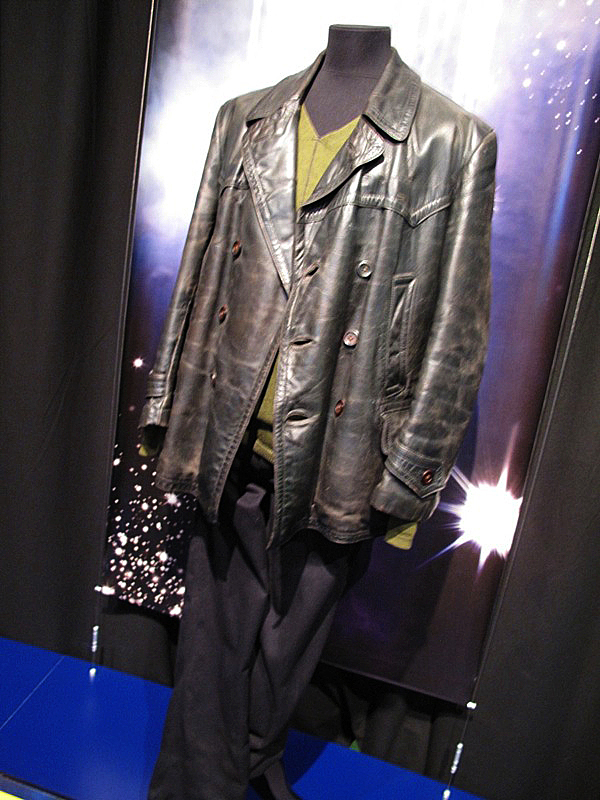 The first exhibition (Brighton in 2005) was naturally all Ninth Doctor. 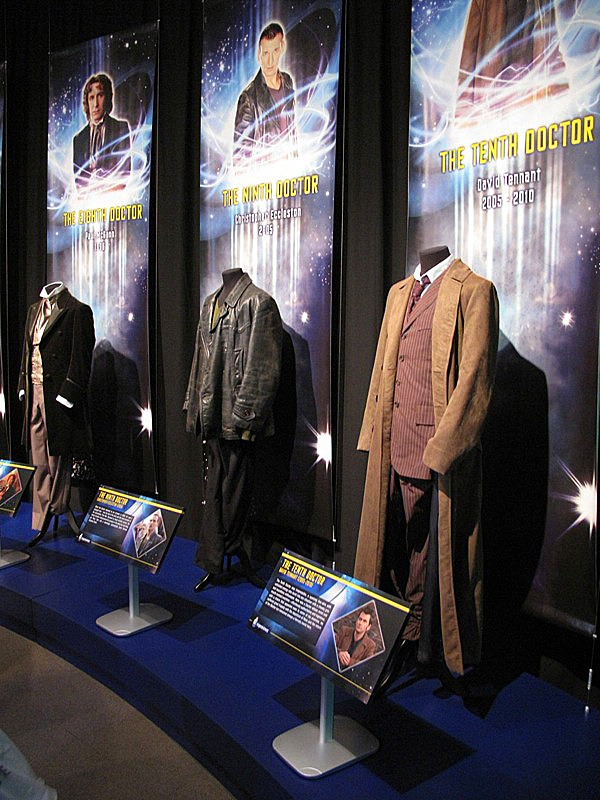 Later exhibitions quickly gave way to a 80/20 split in favour of the Tenth Doctor, and at the last incarnations of the exhibitions you’d struggle to find anything other than Tennant era costumes. So now we re in the Matt Smith era his dominance is rapidly taking over, with almost every of his 14 episodes to date significantly represented. 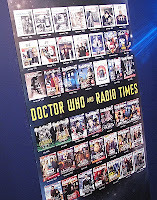 That said, the legacy of Radio Times covers doesn’t go unrecognised, with all twenty on show! When it came to looking at the display for the Tenth Doctor’s costume, I was really pleasantly surprised. 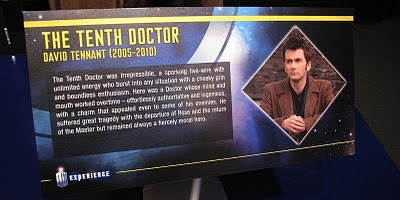 There’s a true treat in store for the Tennant aficionados! As far as I am aware (someone correct me if I am wrong) all previous displays of The Doctor’s outfit have always included one of his blue suits. 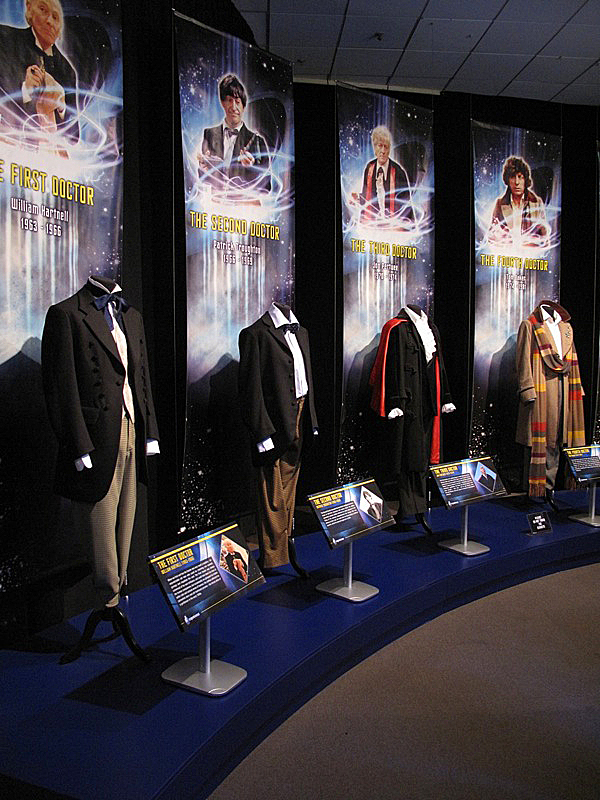 I know of at least two if not three different versions of these suits used for the exhibitions. Here we have, for the first time, one of the brown suits made from the GAP trouser fabric. Having recently worked intimately with the material I can vouch for it, and tell that it is quite faded and worn, which was I gather one of the ongoing problems with the fabric (hence the introduction of the blue alternative). The tie here is Tie Two from my Tie Index (the Daniel Hechter label). 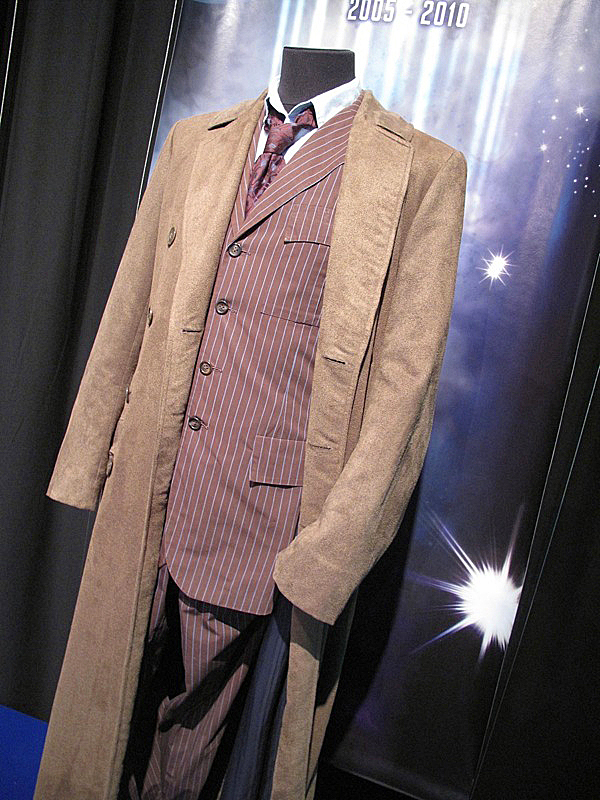 The coat, for the first time, is a screen-used coat, and not the prototype from the Earl’s Court exhibition. IT does not have the seam 9 inches from the hem where Phil Collinson hacked the length down before realizing it did need to be looong! Past the costume displays you do get to see a stunning recreation of Tennant’s console room, which looks ever impressive despite the enormity of the new Matt Smith version. 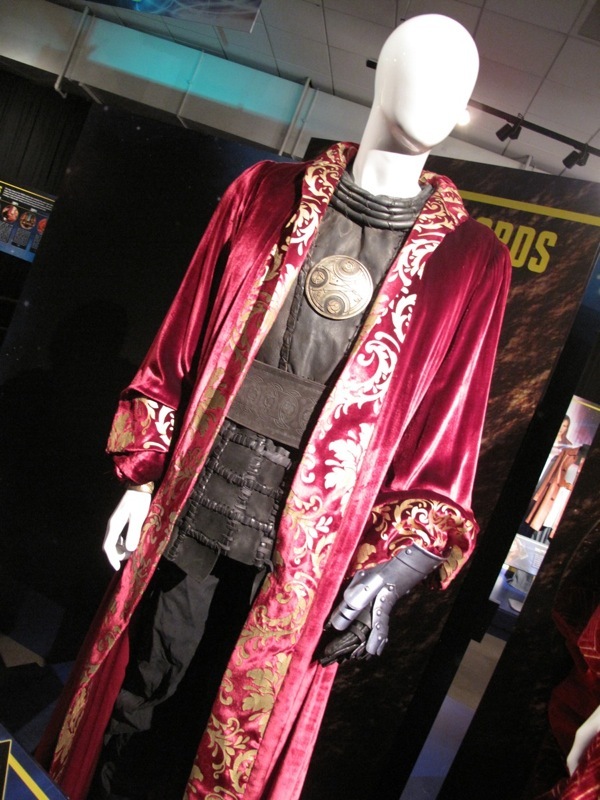 The display of time Lord robes and costumes is firmly in the Tennant era, with Rassilon’s Presidential robes (see left); Derek Jacobi’s costume as Prof Yana prior to regenerating into John Simms (see below); and in the middle a classic Time Lords robe and collar. the latter is with the original Gallifrean seals of the classic series, rather than the reimagined ones from the recent appearances. In the companions display every single associate of the tenth Doctor is represented. 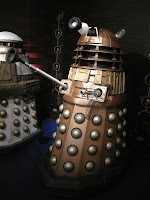 From a pristine K-9; to Sarah Jane’s reporter cloths from School Reunion; Rose, Martha, Donna, Capain Jack and even Astrid make an appearance (see below). The entrance to the Monster Zone is flanked by two new series Cybermen (see right), and past the Cyber head displays, Davros leads the line of heritage Daleks (see below). The Sontaran Line-up is rounded off with General Staal from The Sontaran Stratagem. 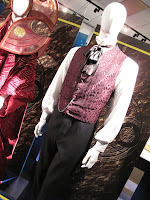 Elsewhere, a Pig Man from Daleks In Manhattan; The Sisters of Plenitude’s Novice Hame costumes from both New Earth and Gridlock; ; a scarecrow from Family Of Blood; two Hath from The Doctor’s Daughter; and a Heavenly Hot from Voyage Of The Danmed all remind us of the fantastic legacy the Tenth Doctor’s era has left (see below). 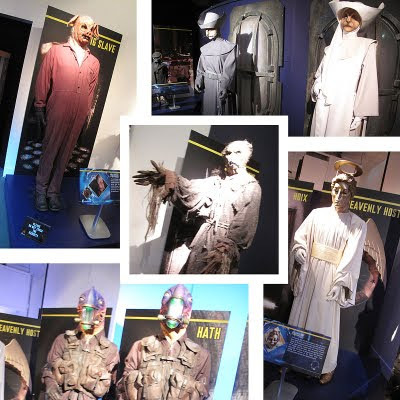 Finally, there is a very impressive display showing how Millennium FX produce some of the amazing full head masks seen in the series. 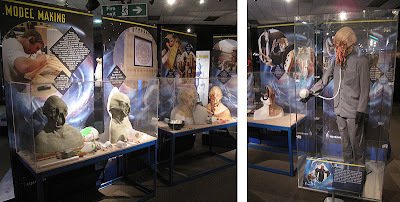 It shows every stage of making an Ood, from clay sculpture (see below, left) right through moulding; silicone and painting; to a full Ood costume (see below, right). You can read each of my other Doctor-specific reviews in appropriate blogs by clicking the links below. I gotta stop doing this to myself!